In the first of these posts, I mentioned that the Voyager program was initially going to be part of the Mariner program, which visited Mars in the late 60s and early 70s. The original plan was to take a grand tour of the outer planets, but as is always the case, the budgets got in the way, the mission was changed a bit and ultimately re-named. It’s amazing to think that a program so extremely successful was one that had its funding pinched. A similar example is when you see those beautiful photos of Saturn from Cassini, remember that budgetary concerns caused them to cut the articulation system for the camera, so the entire spacecraft has to turn in a special direction for whatever shot it wants to take. Say what you want about NASA, they have a history of getting things done despite a seemingly constant budget battle. On a happier note, one big help to the Voyager mission was a newly (at the time) devised way to save propellant by using the gravity of the planets it visited as a boost. We now think of this as commonplace for our spacecraft and frequently see referenced in the world of sci-fi as a “gravity slingshot”. Another bonus was a very convenient alignment of the planets the mission intended to visit. Despite all of expected and unexpected challenges, the Voyager program had a lot going for it right from the get-go. This picture links to a more thorough explanation. Voyager 1, oddly enough, launched second and doesn’t get as much attention nowadays as Voyager 2, which went on to be the only craft to ever visit Uranus and Neptune. Because it began its journey into interstellar space just after visiting Saturn, however, Voyager 1 is now MUCH further from our sun, over 10 billion miles, which is about three times the distance to Pluto! Wild. The visit to Jupiter showed us how dynamic the seething and churning gas giant really was: a complex system of storms and extreme forces. These images became the standard against any future image would be measured and in some cases, still are. One of the most astounding things to keep in mind, is that Voyager I didn’t just have some snazzy digital camera on the end of a robotic arm that could happily snap off photo after photo, they had what were essentially two TV cameras (one wide angle, one not) that were taking in data to be turned into images back on earth. Think for a moment about the split second it takes for an image to be downloaded to your computer via whatever current internet connection you have. Then remember what this was like when you only had dial-up, maybe not even 15 years ago. What a joke! 56kbps was “fast”? LOL! So, now you’re done laughing about how you once may have had to wait minutes for a wired connection to produce an image of a kitten dangling from a branch, praying nobody tried to call you before the file was completely downloaded and you could read the “Hang In There!” at the bottom. Now, imagine it’s almost 20 years earlier and instead of a telephone wire, you have a radio interface with a download rate of 160bps (note the lack of anything before the “b”) and instead of the signal coming from a website for motivational cat pictures, it’s coming from a spacecraft 500 million miles away, traveling at high speed and any transmission takes over four minutes to reach you. Good thing your computer has a fresh 256K roll of magnetic tape! Now look at the above image again and it’s easy to understand why this was so damn amazing. The other big surprise, which I briefly mentioned in the first post, were several discoveries about Jupiter’s moons, most notably Io and Europa. Io, it turns out, is like a giant paperclip being bent back and forth by Jupiter and the other moons’ gravity, heating it up and making it the most geologically active body in our solar system. It spews sulfurous magma up into plumes that were first noticed by Linda Morabito, making her humanity’s first witness to volcanism outside Earth. 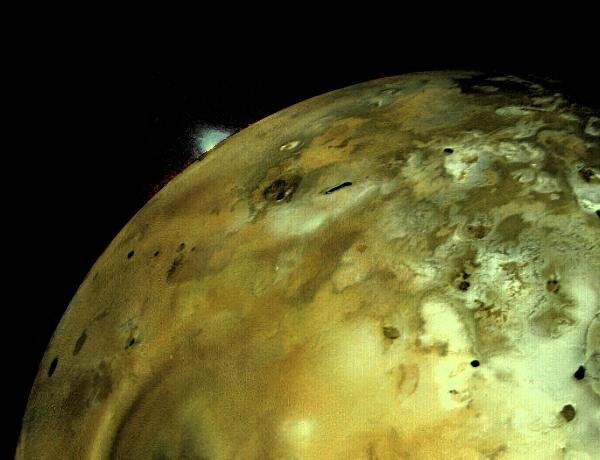 Io is very beautiful, extremely volcanic and almost certainly smells terrible. Europa, on the other hand, is an icy wonderland. Giant fissures and chaotic surface features make it seem certain that a huge ocean lies beneath the surface, perhaps completely separating the ice shell from the rocky surface of the moon. The ubiquity of the liquid water is not in question, but the thickness of the ice is. We’ll know soon enough, we should have a probe there in less than a decade that will finally answer this question and many more. Before Voyager though, we had little more than speculation about what Europa was like. After Voyager, it became common to think of Europa as a possible haven for life outside earth. If something is living in the solar system beyond Earth, and you asked me to bet on where it is, I’d put my money on Europa. This is a mosaic, not a single image, but it is beautiful. I'm not saying I'd like to live there, but I hope something does. So this was the first stop, just the beginning. It made the wait for the Voyager mission to reach Saturn even more exciting and gave us plenty of science to keep us busy until then. Certainly they did more than take these few pictures of only these moons and the great red spot, so I hope you find out the rest of the story from the Jupiter system visit. One more thing, however, that I feel is germane to this post and I feel compelled to mention; last year Björn Jónssen over at unmannedspaceflight.com used voyager data from 1979 and modern imaging methods to create a mosaic of the great red spot that is utterly mind-blowing. The image below will link to the enormous original, which should absolutely be seen by everyone.